We lost Bird last week. I got up to feed and he was gone. No sign of struggle, it looked like he laid down and died. I hope that was the case. A beautiful soul like Birdie deserved nothing less. He’s buried in the pasture with his other friends. We’ve planted forget-me-nots on his grave. He has a pretty marker with a running horse on it. I’m heartbroken. He touched so many. I posted his loss on Facebook and got many responses. He was a wonderful teacher, therapist, and friend. I’ll miss him every day. Sorry to have to tell you this. I know you knew him first. His life will be celebrated here forever. “B” words reflect so much of the beautiful being that was Snowbird. Some of his story appears in Chapter 12, “The Rhythm of the Strands,” much of which I’m including below. If you’ve already read the book, you might remember that for the last seven years of his life, from 2009 to 2016, Bird helped numerous children, teenagers, and adults, through his role in Take the Reins, a wonderful horse therapy program in Summit County run by “B” Casapulla and Helen Royal. Around 2009, B and Helen learned about another SAR horse, Snowbird, often called Bird. He’d run into problems with its owners, and Clara, because of their guarantee, had bought him back from the man. Bird had served as a show horse for his daughters for a number of years, but then the girls either didn’t want to or couldn’t show him anymore. The dad decided Bird needed a job, and the one available was as packhorse on a hunting trip. As an arena horse, a show horse, Bird had excelled. He’d been handled by the daughters, who’d doted on him. Now he was to experience something quite different, something that required unfamiliar equipment, travel over varying terrain, and unusual, inanimate cargo. The experience proved to be a damaging one. On the hunting trip, Bird fell off a ledge and was badly hurt. When Clara heard about the incident, she was furious with the man for giving Bird a job for which he was so ill suited. She took the injured horse back and put him in pasture. She wanted to let him, in her words, “be a horse and relax for a couple of years,” to fully recover from the ordeal. Whispers of coming and going. Snowbird’s accident didn’t diminish his beauty. During his convalescence, artist Linda Gulinson photographed him, and from the photograph, painted a stunning picture. The painting, an impressive thirty inches by forty inches, now hangs in Clara’s living room. Linda’s specialty lay in Western art, with a focus on Native Americans, and more specifically, on Native American children. But when Singing Acres Ranch came into her life, she began to paint horses . . . When the Gulinsons came to visit, Margaret and Clara would get the colts to do all kinds of exciting things for Linda’s camera, run, frolic, chase each other. 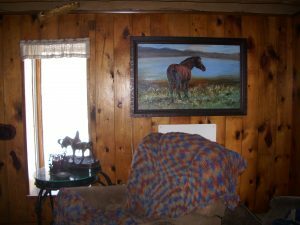 As a result, Singing Acres Ranch horses grace not only corrals and pastures across the country, but also the walls of many homes and offices through Linda’s paintings. The other is the later one of Bird when he was convalescing, in which he’s standing by the pond looking around to his right. His mahogany bay coloring is sprinkled with a few white App spots across his rump, his black mane and lower legs contrasting beautifully with his coat. He exudes tranquility . . .
One day when Helen and B were at the ranch, they met Bird, and they fell in love right away. Given his calm disposition, Clara was sure he’d make a good therapy horse and sure enough, he was a hit in the program. At first, although sweet and well mannered, he was a little standoffish, not connecting immediately. This wasn’t a problem since Helen and B knew that their horses’ quirks could also be assets for their clients. So when they did horse introductions, they told his story in terms of what clients themselves may have experienced. They talked about how Bird had overcome hardships himself, that he’d been hurt and was scared to connect. B thought that whether this was true for a horse is anyone’s guess. But the idea worked well for kids who needed to learn to overcome adversities themselves. It was especially useful for those who’d never been around horses to hear about Bird’s reserve. Many people in the program hadn’t had first-hand experience with horses, and it was Bird they instinctively trusted. Kids and adults gravitated to his calmness. Once, when a newspaper reporter came to do a story on the program, B and Helen offered to take her through a traditional first session. As usual, they gave highlights of horses’ stories that they thought most closely paralleled the client’s story and let her take it from there. This reporter had been in nursing but had recently changed her career to journalism. Although happy with the change, she knew that because she was new to the work, she hadn’t yet developed much confidence in her ability to do it. She was right in the middle of the crossroads of rediscovering herself, with all its doubt and uncertainty. When she heard about how Bird had been a show horse, how he’d then been used as a packhorse and suffered the accident that triggered his return to Clara and subsequent move to Take the Reins, she chose him. She could tell he was a little cautious, mirroring her own restraint, her own uncertainty. She had, in fact, been afraid to get close to a horse. They were new to her, and they were big. It took her some time to go near him, then longer to be able to touch him. When the article appeared, Helen was pleased to see it written it as the reporter’s own story, that what had happened between her and Bird was a fitting reflection of the program’s power and effectiveness. In an accompanying photo, she had her arms around Bird’s neck, hugging him. Snowbird has a special place in my heart, too. On May 10, 1992, the first anniversary of my sister’s death, David, my partner in life, and I were at Singing Acres. It had snowed the day before and the air held the memory of the storm, misty clouds cloaking the mountains and hanging low over the meadow. Inside having morning coffee with Margaret and Clara, I was soaking in the warmth of the fire from the old rock fireplace and the warmth of our friendship as we sat around catching up on what had been going on in our lives. David was out taking in the crisp morning air and enjoying poking around in the rustic mountain setting. Without warning, he burst through the door, breathless with excitement. “There’s a baby, and it’s just barely here!” he cried. David and I watched the newborn struggle to his feet for the first time, his long, skinny black legs wobbling with the effort. A few minutes earlier, he’d been in a warm, dark place, now there was brightness, cool, soft air, and a whole world to become acquainted with. Seeing this new life seemed such a gift, on that day of all days—a first anniversary I’d approached with apprehension—and he was a beauty. The day had turned into a beauty, too. The bright Colorado sun had burned off the misty clouds, revealing a brilliant sky, a smiling sky one could say. It was as if the sun were greeting the brand-new baby, too. Soon after, back at home in Denver, we talked with Clara. “It seemed only natural to call him Snowbird,” she told us. We agreed. It seemed the perfect name. Having been there when Snowbird arrived, hearing the stories about him over time, listening to Brenda and so many others tell about Margaret and Clara, I think of the many ways our lives are braided, intertwined whether we’re kin or not, whether we’re horses or human. We touch each other’s lives, often unexpectedly, catching up, blending in, letting go. This is the rhythm of the strands, the whispers of coming and going. This is the rhythm that spoke to me on the first anniversary of Susan’s death, that spoke to my heart with the birth of that beautiful colt. And this is the rhythm of Singing Acres Ranch that speaks to me still. Thank you, Bird, for teaching us so many important life lessons. Your presence in our lives was a joy, and memories of you bring comfort. We learn from you still. You may remember the Cartmill family [Ch. 8)] whom Clara and Margaret met through mutual friends from Kansas. Not only did Danny become like a son to Clara and Margaret, but also parents Marj and Dan and the whole Cartmill family remained close to them over the years. At one point in my writing BECAUSE WE WANTED TO! I received a note from Marj and Dan with a letter Clara had written them several years earlier. One of many artifacts and stories I couldn’t quite fit into the book, it remained in a file, haunting me. I knew I couldn’t possibly rephrase it and capture the spirit with which Clara wrote it. But the blog now allows me the chance to include the whole thing in original wording. So, in Ring Number One, here are Clara and Margaret in action! After school Margaret progresses to Sherry’s Rockvale chateau to nab said Tom, remembering, “He can’t run away.” Well, said Tom is no longer in ICU. He gets up and runs. Margaret hotly pursues and at last prevails. Turkey tires. She gets him in the back of the car and tells him, “Stay!” Fast trip home ensues. Meanwhile, Clara is back at the ranch, home from a typical day at school—you guessed it, kids throwing erasers, etc., anticipating a quiet peaceful Thursday evening with “Bill Cosby” and “Cheers.” Little does she know what lurks for her in the minds of Sherry, Margaret, and Tom. Have you ever tried to picture a LARGE turkey who has had a stroke lying in the back of a Toyota? All kinds of things went through my mind, but not to worry. After all, how hard could it be to kill a disabled Tom? He’s probably lying out there flat on his back begging for euthanization, right? WRONG. No, first we have to heat some water in the dunking barrel to dip him in after his demise. No problem—put barrel on rack in ditch—put four buckets of tepid (faucet) water in barrel—light dragon’s tongue—aim at barrel bottom—bring water to just under boiling. Now to kill Tom with the thought in the back of your mind that a dead turkey once broke the hand of an acquaintance of yours . . . but this one’s had a stroke . . .
Sure. Easy. Ax in left hand, turkey head in right hand. Ax off the head without hitting Margaret in the head or cutting off your own right hand. Easy. The next day Margaret took him down to Double C Meats to get him smoked. No one has an oven big enough to cook him. We’ll have enough smoked turkey for the next several Thanksgivings! The meat market man said, “That’s one big turkey!” He must have weighed 40 pounds dressed. This all happened week before last. Margaret is almost all healed up. She really shouldn’t mess with turkeys.